Immanuel Kant (1724-1804) was a philosopher from Germany. He is often referred to as the paradigmatic philosopher in the European Enlightenment. His thoughts continue to have major influence in contemporary thoughts especially in metaphysics, ethics, political philosophy, epistemology, aesthetics and philosophy. Kant was born in 1724 in Prussia in Russia. He was the fourth born of nine children. Kant was a solid student. He went to school at the Konigsberg University where he studied science and philosophy under Martin Knutzen. This is where he was introduced to the mathematical physics of Newton. Immanuel became a private tutor after the death of his father interrupted his studies, but he continued with his scholarly research. In 1747, he published his first publication in philosophy – Thoughts on the True Estimation of Living Forces. Kant produced several arguments against idealism. He laid down the Nebula Hypothesis in which he argued that the solar system created a big cloud of gas called a nebula. He attempted to elaborate on the order of the system, seen from Newton previously, as being created in the beginning by God. He also confirmed that the Milky Way was a big disk of stars which were formed from a spinning cloud made of gas. He also suggested that the possibility of other nebulae could also be big and distant disks of stars. These discoveries opened new possibilities for astronomy. 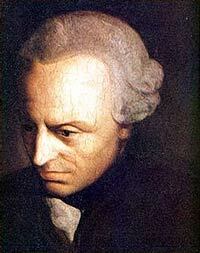 Kant placed thought over nature and religion in one of his publications, stating that some part of Christianity relies on morality and reason. His key point was that the Bible should be viewed as a source of morality without considering any truth behind supernatural factors. Kant was also exposed to Islam and reflected about the role of the reason in that work as well. Kant’s thinking on religious grounds was used in Britain and challenged the decline of religious faith in the 19th century. The British Catholic writers like Hillarie Belloc and G.K. Chesterton followed Kant’s approach. Scholars have shown that Kant’s critical theories inspired political thinkers lie Tariq Ramadan. He made a significant astronomical discovery and a major discovery on the nature of the rotation of the earth which won him the Berlin Academy prize in 1754. Kant died on February 12, 1804. His tomb is a mausoleum today and it is in the northeast corner of the Konigsberg Cathedral. The mausoleum was built by Friedrich Lahrs and it is one of the few artifacts of German times that have been preserved by the Soviets.